[15. 6. 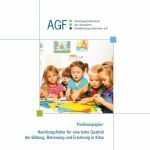 2011] The FAMILY PLATFORM aimed to develop a research agenda for family issues on the EU level. Correspondingly, reports were created, which include inter alia the upcoming trends in family policies and the current state of research. 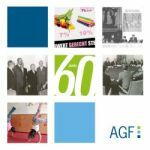 The AGF has and summarized the reports from a German perspective. From late 2009 up until March 2011, the FAMILYPLATFORM compiled priorities for a research agenda for family issues at the EU level, which are to be reflected in the Eighth Framework Programme of the EU. 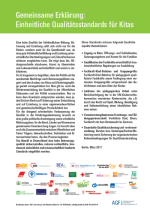 The work was coordinated by a consortium of twelve organizations. In order to establish the research agenda, it was necessary to gain an overview of the current research, to identify future research necessities as well as future trends in family policies in Europe. 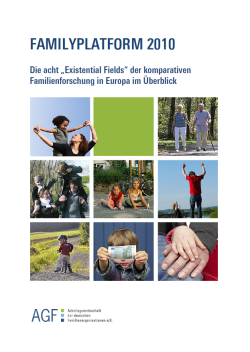 Correspondingly, reports in eight different "Existential Fields" were produced, which were discussed in a dialogue between stakeholders in society, science and politics. The dialogue took place at two conferences (May 2010 in Lisbon, and in November 2010 in Brussels), each with about 150 representatives from academia, civil society and politics, as well as over the internet under http://familyplatform.eu.